Artwork Approval relies on several different technologies for the feature to work correctly. Since our customers utilize varying pieces of hardware and software, it is important that we perform several checks prior to allowing the user to enable artwork. By performing these checks we are helping to ensure that Artwork will properly function when enabled. When you are first updated to version 5.75 and you click on the Artwork tab on any order or estimate, you will see the below screen. You'll need to click the green Check Compatibility button to start the series of checks to verify your system is setup to work with Control's Artwork Approval feature. As Control performs each check, the appropriate result (Passed, Warning, Failed) will display in the Status column. Once all of your checks show as Passed, you'll be able to click the Select Plan button and proceed to enabling Artwork Approval. For any check that fails, use the information in this WIKI to learn what causes each specific check to fail. If the Artwork Tab doesn't appear on the Order or Estimate, check for a solution artwork_tab_doesnt_appear. Since the Artwork Approval feature relies on the document_management feature to access proof files, it is essential for document_management to be enabled in Control for both orders and estimates. To learn more about the document_management feature, click document_management. Check the Enable document_management option. That will allow you to enable the document_management feature for orders, estimates, and/or companies. Click the Save button on the right-hand Action Toolbar to save your settings. After enabling the document_management feature, you will be required to enter in a file path in the Path/Share for Access to Documents Root Folder option. The default location is \\Your Server Name\Cyrious$\Documents but you can manually change the location by clicking the Browse button and navigating to the location where you want your files stored. If you have more than 1 computer that will access your documents, the document management path should be the path to a shared network folder. The most important thing to keep in mind when deciding where your files will reside is the file path character limit imposed by Windows. Windows allows file paths to be no more than 255 characters; therefore, Cyrious suggest saving your files as close to the root directory (\\My Server\ in the graphic below) as possible. Here's a graphic that should illustrate what the “Documents Root Folder” is and what we're referring to when we mention the file path length. when the number of characters used in the Path/Share for Access to Documents Root Folder option are less than or equal to 50 characters. This should leave you with enough available characters to name files as needed. when the number of characters used in the Path/Share for Access to Documents Root Folder option are between 51 and 110 characters. when the number of characters used in the Path/Share for Access to Documents Root Folder option are more than 110 characters. This will leave you with about 145 characters as your file name. Although that may sound adequate, the entire path from the order to the thumbnail files that are created for your proof generally add over 100 characters to your document management path. After checking your document_management file path length, the next check that Control will perform is to verify your document_management file locations are not using mapped network drives. This check applies to the root folder path as well as any alternate paths. Cyrious supports the use of accessing files on network drives, storage devices, etc. however when you configure document_management you should use the Uniform Naming Convention (UNC) path and not a mapped network drive path. Artwork Approval only offers limited support on Alternate Paths. Those paths are only meant for Historical and Archival purposes, as such Cyrious Document Access Service (CDAS) does not monitor those paths for any file changes that occur. In this example, on each of our computers we will have a couple mapped network drives. We store all of our files on the Q:\ mapped network which is really just a shared folder that is present on the NT-SERVER01. This means that when you open the Q drive, you're really navigating to the \\NT-SERVER01 server. If this is the location where we want our document_management files stored, you should enter the UNC path to the shared folder (NOT the mapped drive letter) into the Path/Share for Access to Documents Root Folder option. Below is an example of mapped network drives on a computer when opening Windows File Explorer. when no mapped network drives are used in the Path/Share for Access to Documents Root Folder option. when a mapped network drives is used in the Path/Share for Access to Documents Root Folder option. After the 3 document_management checks are performed, Control will verify 1) that you have the cyrious_cloud_connector (aka Homegate) enabled in Control and 2) that your Control license is authorized to use the cyrious_cloud_connector. To learn more about the cyrious_cloud_connector feature, click cyrious_cloud_connector . Check the Enable cyrious_cloud_connector option. You should see cyrious_cloud_connector listed as an authorized module. The most common reasons why this would not be listed as an authorized module is because the user is not currently on a technical support plan. when the cyrious_cloud_connector is enabled AND the customer is authorized to use cyrious_cloud_connector. when the cyrious_cloud_connector is NOT enabled OR the customer is NOT authorized to use cyrious_cloud_connector. Customer Artwork Approval requires the cyrious_cloud_connector to be communicating properly in order for a customer to be able to access their artwork groups, proofs, and comments. If the cyrious_cloud_connector is not functioning properly then a customer will not be able to access any link that you provide to them for the purpose of reviewing any artwork. During this test Control is checking to make sure the cyrious_cloud_connector has established a secure connection with our Cloud servers. One reason a user would get a warning message would be if they don't have a Cloud RootPath entered on their company record in the internal Control database. The cyrious_cloud_connector is communicating properly. 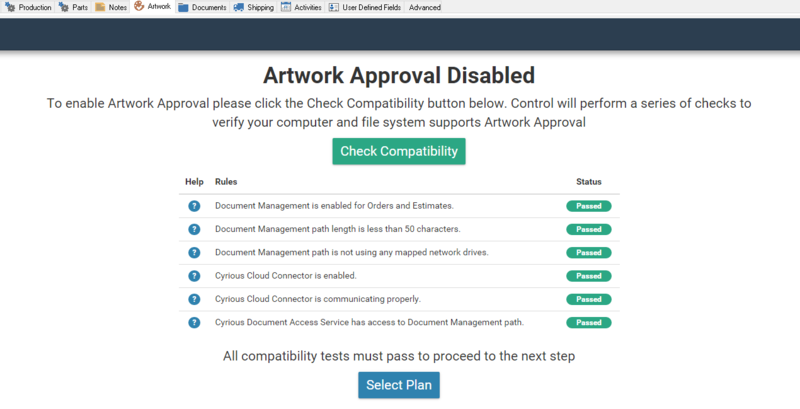 The cyrious_cloud_connector is not functioning properly, you are still allowed to enable Artwork Approval but you will not be allowed to enable the Customer Artwork Approval CloudApp. CDAS is responsible for automatically detecting file changes within document management. Any time a user adds a new file, renames an existing file, or deletes a file CDAS is automatically notified of that change by the file system and depending on which type of file change it was will determine what series of automated tasks are performed. In order for CDAS to be notified of these changes the service must be running on a __Windows User Account__  with read, write, and delete access to the document management path. In addition, your storage solution (windows shared folder, network attached storage, etc.) must support notification of file system events. \\ The following network-attached storage devices are known to be __incompatible__  with CDAS. Synology NAS - this device is not compatible because the DSM software installed on the Synology NAS does not send file system notifications to Windows Servers for any sub-folders on a network share. This limitation has been reported to Synology; however, they have not committed to adding support for Windows .NET File System Watcher to their DSM software at this time. Alternative Solutions - although not ideal, these will allow you to utilize Artwork even though you are limited by Synology's incompatibility. Move all document management for your active orders to a Windows shared network folder and keep the Synology NAS as an alternate document management path for all Closed orders. Keep all files present on the Synology NAS but click the Resync button on the Artwork tab after you have placed any new artwork files into the folders for that estimate or order. Purchase a different NAS device. You are using a shared network folder but the CDAS Service has not been configured with a Windows User Account that has read, write, delete access to that shared folder. You are using an incompatible NAS device. You are using a NAS device that is not integrated with your Windows Domain. The CDAS service is not running currently. In each of the cases above the resolution typically involves creating a new Windows User account that has read, write, and delete access to your shared network folder. When creating that user it is best to follow these guidelines. Assign a password that is complex in nature. i.e. At least 7 characters with at least 1 uppercase and 1 number. Enable the Password Never Expires option. Enable the Can’t Change Password option. Configure the shared network folder to allow Read, Write, and Delete permissions for that user account. Configure the CDAS service to use the newly created Windows user account. Click the Edit button on the Action Toolbar. This will enable you to test whether you have access to your document root folder. Click the Test Access button. If you are using a NAS device that is not integrated with your Windows domain then you will need to create this same username and password on that device and configure the permissions appropriately. Is returned when CDAS is able to read, write, and delete files and has received notifications of file changes occurring in the document management folder. Is returned when CDAS is not able to complete all of the tests. When all checks have a status of Passed, you'll be able to click the Select Plan button. 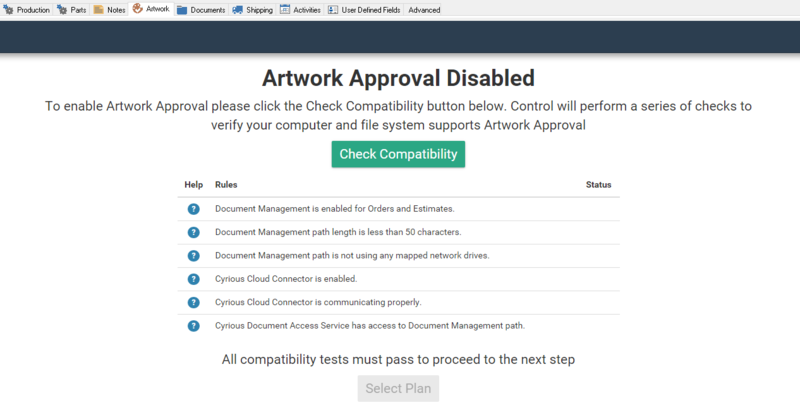 After selecting your plan, continue setting up the Artwork Approval feature with the use ofartwork_approval_setup.